1.If you want to gain more armaments for your mounts, here comes your chance! Various Armament chests(which contain armaments of different kinds & qualities) are available! Meanwhile, the Magic Mount Soul, which is essential to upgrade the armaments is also here. Don't miss out the chance! 2.If you want to dress up new clothing, St. Patrick's Attire and Cupid are waiting in Epic Origin Crystal! 3.If you want to gain more resources and gems, Spirit Essence,Godsend, Lvl. 11 Common Gem Chest, Lvl.11 Fusion Gem Chest, Golden Dragonsoul Packs, Munin's Power and Royal's Mark will be in Mythic Origin Crystal! Apart from the above, you also have a chance to obtain Khaos Equip Card and Khaos Hero Card to add stats to your heroes! Let's see who can get the Purgatory Wand Chest (Legendary) in the ranking! After collecting specified materials, you can craft certain items, including Khaos Core, Rare Flaming Stone, Adv. Soulstone, Lilac Stone, Mythic Divine Stone, Elena's Icon Shard, Element Crystal, Element Scroll, Magic Socketing Rod, Awakening Stone, Lvl.9 Fusion Gem Chest, Lvl. 10 Cherubstone,etc. 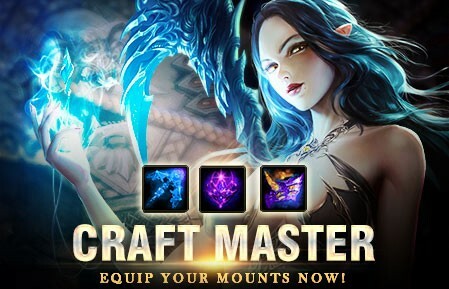 This time Craft Master brings you many skill books with lower discount than before, such as Skill Book-Divine Light, Skill Book-Void Cloak, Skill Book- Shield Rampart, Skill Book-Star Splendor, Skill Book- Mysterious Shandow, Skill Book- Blood Frenzy, Skill Book-Thunder Storm, Skill Book-Thunder Strike, Skill Book-Swift Blade, Skill Book-Radiant Guidance, Skill Book-Dragon Fury, Skill Book-Firestorm, Skill Book-Divine Wrathstrike, Skill Book-Eternal Rampart; And other resources such as Runestone, Seraph's Stone, Enchanted Ore, Angel Tears, Grotto Heart and more! 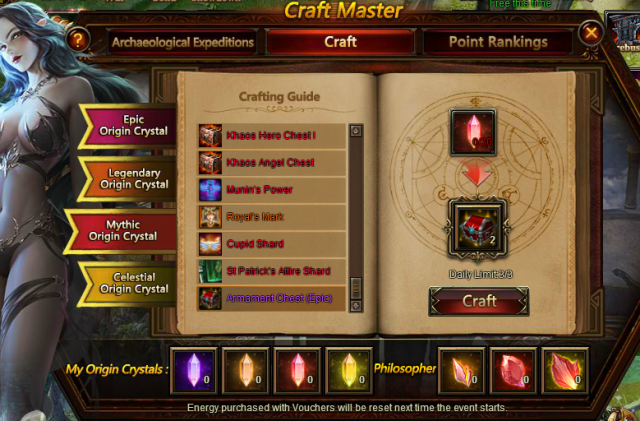 Description: More Craft Master Points, more rewards! More exciting events are coming up through May 28 to June 8 (Server Time), check them out in the in-game Hot Events menu now!